Vancouver Farmers Markets is a registered BC non-profit organization. Your generous donation helps us in our work to provide fun and vibrant neighbourhood markets where people can access, celebrate, and share the abundance of our local food system. Vancouver Farmers Markets feed people and create community. Since 1995, we have served as a vital connection between farm and table, helping small scale producers bring fresh, healthy, and locally-grown food to the people of Vancouver at our vibrant weekly markets. 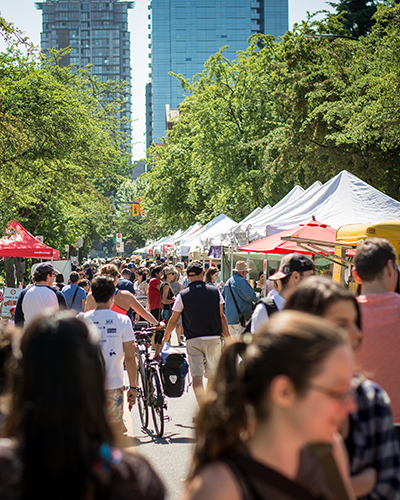 When you shop at a Vancouver Farmers Market, you’re not just buying fresh, delicious food directly from local producers – you’re taking an active part in the local food revolution, and helping to create a sustainable food system in Vancouver and BC. That means helping to feed people in our region, supporting the local economy, and protecting our local environment and farmland for decades to come.